10 pp. Roman, 429 pp. 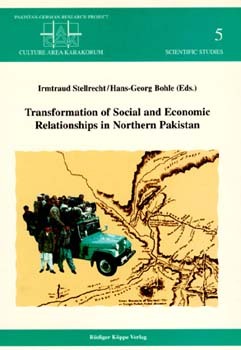 The central aspect of this volume is the interaction between the high-mountain region of northern Pakistan and the political and economic centres of the adjoining lowlands. The contributions by cultural anthropologists and cultural geographers describe the transformation of this interrelation between highlands and lowlands that has been taking place since the 19th century. Moreover, the innovations and the process of change arising from new forms of communication and transport introduced by the opening of the Karakorum Highway are studied from the current as well as the historical perspective.